This is a trail on the western slopes of the Catalina Mountains below Samaniego Ridge. Most of these trails in this area are used as mountain bike trails but do see some hikers, especially as you get higher up on the slopes of Samaniego Ridge. There is a maze of trails in this area many of them are not official named routes. Signage in this area is nonexistent. This trail is entirely on National Forest but access is from State Trust land and a State Trust Land Permit may be required. I was informed by the locals that hiking in the area didn’t require a permit but parking on state Trust Land probably does. The rules for State Trust Land require that you get a permit if entering Trust Land. I went on line and got a year pass for $15.00 to be on the safe side. The Majority of the trails in this area are on National Forest but the Trail Heads are on Trust Land. Access to the Baby Jesus Upper Trail is from the Golder Ranch Road Trail Head via the Middle Gate Trail from its northern access point or from along the Baby Jesus Trail on its northern access point. This was a trail I have seen on maps and is visible on Google earth but I could not find a name for it. It is a good trail and easy to follow, no route finding skills are required; in fact it is in better shape than lots of the other named trails in this area. It appears to be used by both hikers and bikers. This trail deserves a name so I am calling it the Baby Jesus Upper Trail because it is further up on Samaniego ridge than the Baby Jesus Trail. Other options were Baby Jesus East Fork or baby Jesus Cherry Tank Interconnect. 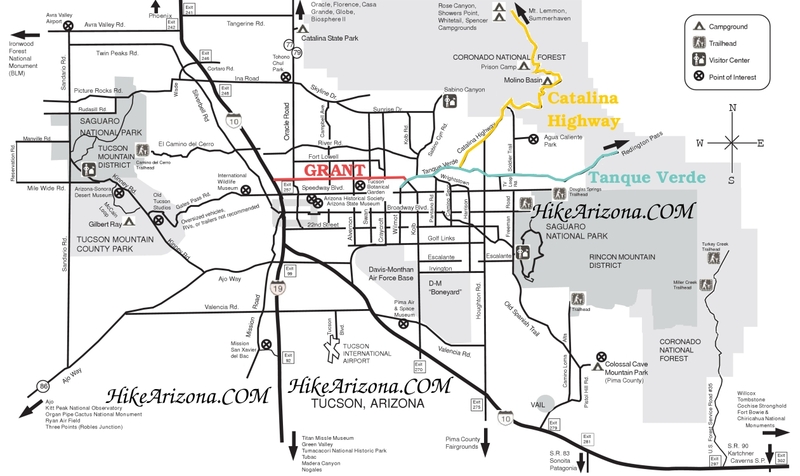 This trail starts along the Cherry Tank Trail 200 feet from the Middle Gate Trail. This trail is 2.4 miles with an elevation gain of about 300 feet from north to south. The trail heads east and climbs gradually about 100 feet before heading south and dropping back down 100 feet as it crosses a major creek that comes down off of Samaniego Ridge. Crossing this creek will take about 1 mile with an elevation gain on the other side of about 150 feet. At 1.3 miles the trail comes to a cement trough at a small nondescript stream at a place called Cement Dam Tank and Spring. There was water in this tank in October even though it had not rained in over two months. This appears to be a rather permanent spring. Large Oak trees provide a nice cool place to take a break. For the next mile the trail gradually climbs another 150 feet as it approaches Baby Jesus Ridge and the Baby Jesus Trail. This is an easy trail to follow with great views to the east of Samaniego Ridge and Peak. This is the closest trail to the ridge of all the trails in this area, and offers the best views of Samaniego peak. There is a large cement tank just downstream of where the cement water trough is and might warrant some exploring. This trail crosses a creek that comes down off of Baby Jesus Ridge just prior to reaching the Baby Jesus Trail and looks like another good area to explore. Lots of large oak trees and seems a little too green for there not to be some source of water. This trail along with the Baby Jesus Trail makes for a good loop hike with an in and back side trip to the Sutherland Trail in Cargodera Canyon. From Tucson take Hwy 77 (Oracle Road) to the town of Catalina. At Golder Ranch Road turn right. Follow Golder Ranch Road until it turns to dirt, go through the cattle guard, take an immediate left on E. Equestrian Trail. follow the dirt road for 0.6 miles turn right at the corral. Follow the 4WD road 0.7 miles to trail head at corral and cattle guard.